Locality: United States, Colorado, Gunnison, Canyon of the Lake Fork of the Gunnison River, ca. 3 mi NNW of Gateview. On vertical cliffs right beside the old railroad grade that forms the present road. Also seen on cliffs several hundred feet above and several miles down the canyon. Habitat: On vertical cliffs. In very tight cracks with very little soil, but with branched rootstock. 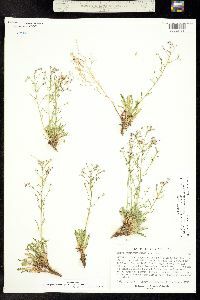 Notes: Aliciella pentstemonoides (M.E. Jones) J.M. Porter, Rev. after Porter, Aliso 17:23-46. 1998. / Aliciella pinnatifida (Nuttall ex A. Gray), J.M Porter (=Gilia pinnatifida Nuttall), Det. W.A. Weber, July 1999. 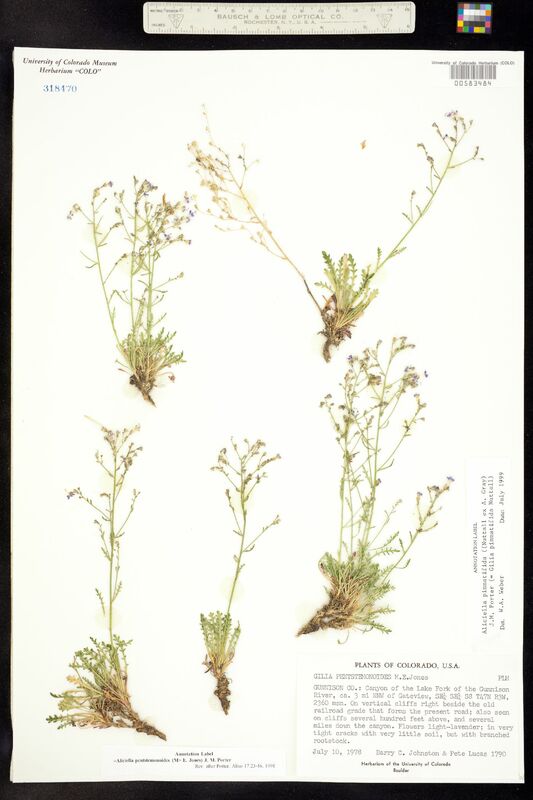 Original ID: Gilia penstemonoides. Flowers light lavender.